According to the most recent CREB report, the city of Calgary has experienced a 23 percent increase in sales activity when compared to this same time last year. As a result, the city has also enjoyed a significant increase in its year-to-date sales activity, which is already 16 percent higher than that which was achieved in 2011. Nonetheless, CREB President Bob Jablonski cautions that these trends are simply returning to levels that are consistent with long term trends and that Calgary prices have not fully recovered from the recession. While the national trend is not as promising as Calgary's, there is plenty of reason to believe the city's market will continue to move in a positive direction. In October, sales improved across all housing types within the city. With sales increasing by 17 percent when compared to the same time last year, single- family homes experienced the greatest growth. Apartment condominiums also saw growth, with sales being nearly 12 percent higher when comparing this year to last year. 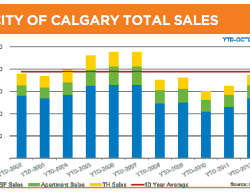 Listings within the city of Calgary also experienced an upward trend. In October, the total number reached 2,312. These figures represent a 9 percent increase when compared to last year. Although the number of new listings compared to sales has continued to cause a reduction in inventory, CREB reports that October is typically a slower time of the year within the real estate market. Therefore, the supply remains within what would be considered balanced levels. On the other hand, the strong demand has led to an increase in the cost of single-family homes in the city. According to the October CREB report, the benchmark price for a single-family home was $433,300 in October 2012. This represents an 8 percent increase when compared to the previous year. Nonetheless, unadjusted home prices have remained relatively unchanged over the past four months and are still below the highs that were recorded in 2007. Condominium apartments, on the other hand, have fallen more than they have increased, but have managed to recover to levels that are comparable to 2010. In October, they increased by 3 percent when compared to the previous year to reach a benchmark price of $247,000. So far this year, condo townhouse sales have reached 2,279. These figures represent a 16 percent increase when compared to last year. Benchmark prices for condo townhouses also increased, as they saw a 3 percent growth to $279,000.